Why are drones gaining popularity these days? What do people get out of having these “small flying stuff” in their possession? Drones are flying objects that are operated remotely. The user can attach almost anything to the drone to assist him or her in what he or she is doing. Those with camera and WiFi, are not only used to have fun, but also for a lot of other things such as vicinity surveillance, taking pictures and videos for personal use, and even for improving children’s hand-eye coordination and motor skills. Since drones have significant contributions in various industries and have recreational and personal uses, currently, they are commercially available, and anyone can use it as long the person knows how to use a controller. Also, do take note that drones that have an actual weight heavier than 0.55 pounds should be registered with the Federal Aviation Administration (FAA), as they can hurt people and destroy properties. One particular camera drone that caught our attention is the DBPOWER Quadcopter WiFi Camera Drone because the possibilities of having fun and doing something useful are endless. It is also the perfect drone for beginners because it does not need FAA registration, and it is easy to control to satisfy everyone’s craving for being in control. That said, let’s evaluate it further to determine if this will suit you or not. This quadcopter from DBPower has a lot of features that will make anyone’s first drone experience fun and memorable. The controller is comfortable to hold because of its rounded sides. It looks similar to the famous black joysticks that are normally used when playing computer games. There is a very shallow learning curve in operating the drone with the controller as it does not have a lot of buttons and functions. It only has two basic, small joysticks on the left and on the right to control the direction and rotation, take off and land, and to have the drone do 360 degrees flips. It also has the one-touch button to command the drone to return to where the controller is. The drone itself, on the other hand, is packed with a lot of fun features. It does have an HD #C4005 FPV high-resolution camera that can take decent pictures that are Facebook and Instagram-worthy. To connect the camera with a mobile device, an app needs to be downloaded from an app store. It works for both Android and iOS devices. Simple surveillance can also be done using the drone as everything that is captured by the HD camera can be seen live on the connected mobile device. In addition, the drone is headless, which means it can easily go wherever the user wants. This feature allows for easy navigation and fewer accidents since the user feels in full control of the drone. The headless function also highlights the 360-degree flip. Since the drone is fully symmetrical, it makes awesome backflips that creates videos that are also aesthetically appealing when done properly. Beginner drones are those that allow for easier control and navigation. They aim to make the first experience of drone-flying as smooth as possible. Most beginner drones do not have a built-in camera or WiFi because these are both seen as a distraction for beginners, but this is not the case with the DBPOWER Quadcopter. The mobile device is strategically placed at the top of the control, and the app still provides clear live feed using just the basic settings. Using the other features of the HD camera can be explored and used later when the user has already mastered flying and controlling the movements of the drone. The HD camera and app are a bonus, making the drone perfect for both beginners and expert drone flyers. 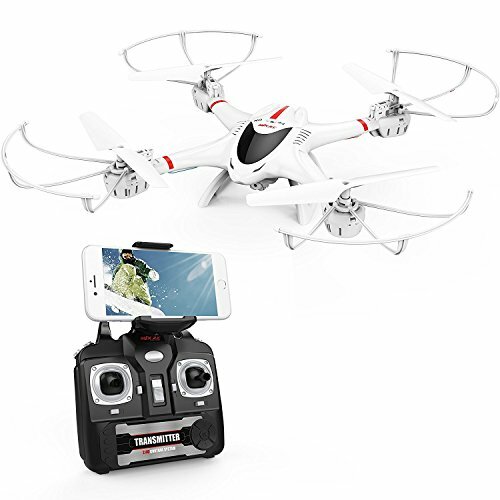 The drone is relatively more affordable compared to other similar products that have the same features (i.e., HD camera, WiFi connection). The seller is also reportedly very responsive to customer feedback and really take customer service seriously. This is something that cannot be measured in monetary terms but definitely makes this product worth the money. It is inevitable that drones crash, so anyone can experience a crash landing. Since the drone itself is made of high-quality materials, it can keep itself together even after a number of crash landings. Nevertheless, it is still essential to use the drone in an open space, such as in a park or lawn to make sure that it does not hit anything tough. Apart from recreation, with the drone’s HD camera, it can be used to navigate a yard or even roofs when looking for something that might have been stuck or accidentally lost in those places. It can also be used to check if someone is trespassing at night or a someone’s pet has gone astray in the backyard without compromising the owner’s safety. Of course, all products have disadvantages. Fortunately for this one, it’s not a lot. Since this drone is lightweight, some of its parts can be fragile, especially if used by people with big hands. Fortunately, the package comes with spare propeller blades and a magnetic screwdriver that come in handy. It appears that the instruction manual of this drone is challenging to follow. However, it is a good thing that the seller has available instructional videos that show everything a user needs to know to enjoy flying this drone. DBPower boasts of their five years of experience in designing and creating drones that are both useful and enjoyable to use. True enough, the DBPOWER Quadcopter WiFi Camera Drone does not only bring fun and excitement but also usefulness and relevance to people’s everyday lives. It is also affordable compared to its counterparts, durable, and it comes with a one-year warranty and lifetime technical support. It might seem fragile for some users, and the instruction might be challenging to understand but this should not be a problem for users that are determined to learn. Looking closely at Holy Stone HS200 Drone, one can easily see the resemblance of the two models. The features and functionalities are the same, as both come with a built-in camera and WiFi connection. It must be noted though that aside from the exemplary customer service that DBPower offers, the cost of getting Holy Stone HS200 is twice as much as buying DBPOWER Quadcopter WiFi Camera Drone. There are a lot of drones on the market today. Some have a built-in camera, and others have a WiFi connection. Others are headless, while most are not. 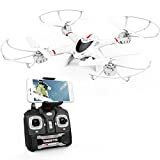 The DBPOWER Quadcopter WiFi Camera Drone is an affordable device that has all the features and functionalities a person would want, making it a useful drone camera for experienced and novice users.